Victorious is one of those memorable phrases you associate with the Roman Empire, and that is exactly what you can expect to see here. Structured around a 243 payline structure this Net Entertainment creations features a host of money spinning prizes, entertaining features and gameplay that will have you engorged. The theme certainly does make this online slot stand out from the others, providing players with just as much fun as they would expect from a similar project from these developers as Victorious packs a punch in almost all areas of the game. NetEnt has ensured no stone has been left unturned in the making of this slot, providing players with the very best graphics, animations and audio pleasure. Every win that players accumulate is met with a suspense filled animation of sirens and pistol whipping, which gives it a really authentic feel. It is the small aspects of the slot like this that make it such a joy to play and will surely tempt you to another few spins when there is a lull in the action. Players will enjoy the attractive and user friendly online casino Mr Green, where this slot machine is offered. 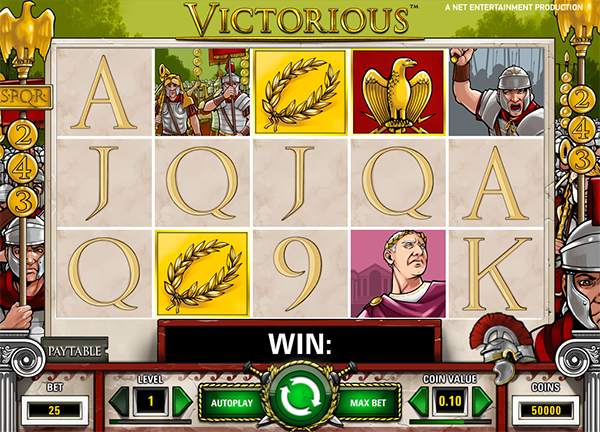 Under the bonnet of the Victorious is much more of Net Ent’s innovative approach to online gaming. This online slot machine boasts some brilliant on reel features and a single bonus round backed by plenty of wealth and awesome interaction. First up is the Wild symbol, which actually appears more often than you would think and substitute for any other symbol, including the scatter. Yes that’s right, usually the scatter is exempt of this rule however victorious allows this to happen, making the task of triggering the free spins round much easier. Speaking of which, players need to spin 3 or more golden wreaths anywhere in the game to trigger this lucrative feature: 3, 4, 5 laurel wreaths awarding 15.20 and 25 free spins respectively. If that wasn’t enough players lucky enough to gain access to this elusive bonus feature will be granted a x3 multiplier an all wins accumulated in addition to mystery instant prize. There are several slot games themed on historic events and characters; fans of these will be happy to try Queen of Pyramids, Lancelot, Rome & Egypt and Spartacus. There are no other bonus rounds to mention within victorious unfortunately but the smaller line wins are frequent, and with the wilds being so generous, players won’t be going long without action. The 243 ways to win structure allows for many possibilities as well. Victorious is available at the very popular Mr Green Casino. Net entertainment could be more adventurous in terms of the in game features it offers players. Although there are plenty of entertaining aspects, the cash prizes just aren’t widespread enough for the slot to become a true fan favourite. What is the maximum jackpot of Victorious? Victorious offers a maximum jackpot of 112,500 coins which can be won during a round of free spins. Victorious offers scatter and wild symbols, multipliers and free spins. What is the payout % of Victorious? The payout % of this game is 96.9%. How many paylines and reels does Victorious have? This slot features 5 reels and 243 paylines. At which casinos can I play Victorious? Victorious is a Net Ent slot that is available at Mr Green Casino.